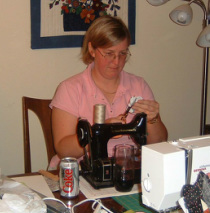 I am a quilter, Professional Engineer, and a Professional Organizer. I was born and raised in a Mennonite Community in Pennsylvania, where the values of simple living, peaceful co-existence, and Christ-like behavior are modeled in everyday life. I have a Masters degree in Mechanical Engineering and have worked for over 20 years in Materials Research and Factory Ergonomics for a large aircraft manufacturer. My career has been focused on cost and labor reduction through process improvements that maximize the efficiency of the factory worker. The efficient work environment is set up ergonomically with Parts, Plans, and Tools accessible. 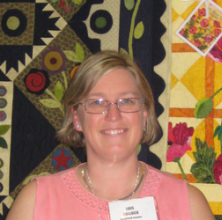 My passion for quilting began after the death of my father. When he left this earth, he left behind furniture that he made with his own hands and documentation in the form of his books. Grief over his death caused me to seek my legacy. 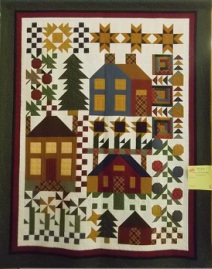 My female ancestors typically left behind quilts that are the clues to their lives and their spirits. I decided to follow in their footsteps and make quilts to express my life and spirit to those around me. My two worlds of quilting and engineering have collided to form a new synergy in my life. I have applied my organizing and problem solving skills to my passion of quilting, forming a whole new perspective on Quilt Studio Design. The energy and enthusiasm created by following my passions launched me into the Professional Organizing business. 425-931-9636 (cell phone) - note I am on the West coast and 7am your time, might not be a nice time for me to receive a call. Also, I work during the weekday at Boeing and cannot answer my personal cell phone at those times, so feel free to leave a message.